Mobile phones have become a universal tool for information seeking and communicating, In fact, 83% of adult American’s own some sort of cell phone. What’s crazy is that my husband is actually part of the 17-percent that does not. He can not stand cell phones. He feels it’s a time-waster, communication-blocker, life-sucking device. I can totally see what he means. I often catch myself with my head buried in my cell phone at home for what seemed like only a couple of minutes … was actually fifteen minutes. Most of the time it’s because I’m checking emails from PR reps or other emails related to my website. But still … life has passed me by. You’re at a traffic light you know is going to be a long one, biting your fingernails as you watch one or maybe two drivers go by. There’s no ringing, no electronic beep or chime, no Bzzzz vibration on the seat next to you or from the holder, yet you pull out your phone anyway—Why? Can’t it wait? Whatever it is. Does the repetitive reassurance of finger swiping or button pushing make it easier for you to sit in silence among your fellow drivers? At any given moment on a regular weekday, about 660,000 people across the U.S. are sitting in the drivers seat and talking on their cell phones. Twice that number were engaging with their mobile device in some way, checking calendar appointments perhaps, replying to email, or planning a route on their maps app. I will admit – even though it’s illegal in Kansas to text while driving – I have done it. I have checked to see what the incoming beep was on my phone. I have used "Swype" to quickly send back even just the word "OK" while my eyes should’ve been on the road. And I’m sorry for that. I’m sorry for putting your life in danger, your family’s life in danger, myself in danger, as well as my own family’s life. I’m putting an end to that today. 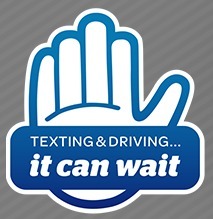 When it comes to texting and driving, it can wait. And I’m pledging my promise NOW and you should too! 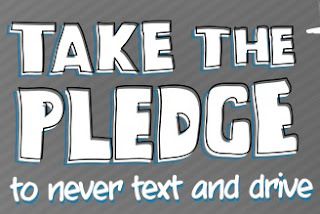 Each pledge made to never text while driving is a symbol of commitment to be part of a movement that helps everyone make safe choices with their wireless devices on the road. Are we in this together? If so … take the pledge with me now. It’s the cool thing to do!